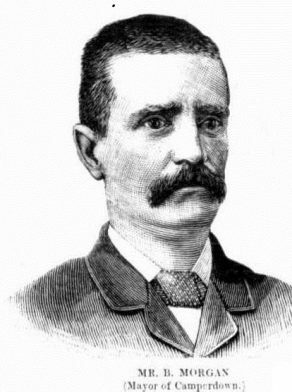 Benjamin Morgan was born in Sydney in 1855. He married in 1876 at Newtown to Mary King (1854-1912). He died on 2 June 1913, aged 58 years. Morgan was a trustee of Camperdown Park. Morgan, a Georgist, unsuccessfully stood as the Labor candidate for Newtown-Camperdown division in 1894, obtaining 30% of the vote. Benjamin Morgan was an alderman on Camperdown Council 1885-1901 and mayor in 1889-90. As mayor in 1889, Benjamin Morgan gave evidence to a Parliamentary Standing Committee on Sewerage.